If you have followed along with my blog posts, I recently posted ‘How I Lost Over 100 Pounds Eating Mindfully’. As a recap, I was a BBQ restaurant owner (smoked meats) and a craft beer drinker. I had gained about 150 pounds in a little over 5 years doing things like eating late after I closed the restaurant, and drinking too much amazing Michigan Craft Beer. My health deteriorated and I ended up in the hospital with a long list of prescriptions. How could someone gain that much weight? Some of it, as mentioned above, was life circumstance. Part of it was poor discipline and poor choices. Another part of it was that I was on a bit of a destructive path after some devastating events (see blog post here) in my life and just didn’t care. It was all a toxic combination. Being hospitalized scared me. I didn’t know what was wrong exactly and neither did the doctors. Their answer was to give me a long list of prescriptions. I had severe Edema in my leg, and my hands and wrists were swelling. I also had an allergic reaction to one of the medications my personal physician had prescribed. When my health deteriorated, I lost everything. I lost my business, my relationship with my girlfriend, and my income. I could hardly walk. I couldn’t work. I could barely function. I am very fortunate to have a supportive and loving family. They helped get me back on my feet. After being hospitalized, I spent several weeks doing some intense research about healthy eating and an anti-inflammatory diet. I realized that I needed a mindset change. I needed to re-prioritize my life and my choices. I found out the hard way that if you do not have your health, you do not have ANYTHING. My research led me many different websites. I did find a lot of conflicting information. There are some very powerful lobby’s and industry advocacy groups in the U.S. that make finding facts difficult. I also found a nutrition website that had a LOT of great information, but they were trying to sell a few certain products and supplements, and it skewed their perspective and their reporting of so-called ‘facts’. The biggest thing that I found is that FOOD IS MEDICINE. Treating a condition from the inside is the best possible route for your health. I decided to use food AS my medicine. I have had a couple of serious back injuries. (See previous blog posts). I was an ibuprofen fiend. I would take SEVEN (7) 200mg ibuprofen 2 to 3 times daily! It would only take the edge off. I never wanted to take prescription painkillers as they are highly addictive so this was the route I chose. 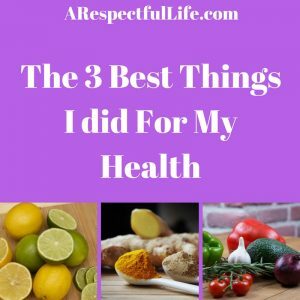 Change #1: I stopped taking ibuprofen and started including Turmeric in my diet. 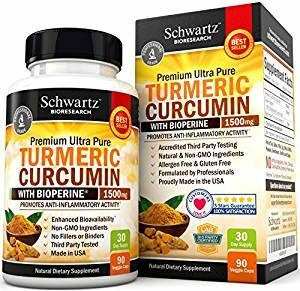 I started taking 3 teaspoons of Turmeric powder daily (one teaspoon, 3 times per day). Turmeric is a powerful anti-inflammatory and better than any drug on the market. You can buy the powder in the spice section or you can take a supplement (buy on Amazon by clicking here). More information on the benefits of Turmeric click here. Change #2: I started hydrating with water that had Lemon and Lime juice in it. This meant that I stopped drinking diet soda (which robs your body of calcium and is full of sodium). Lemons are full of Potassium and Limes are full of Magnesium. Your muscles need Potassium and Magnesium to properly function. When your muscles are ‘spent’ or worn out, they stop receiving blood which also means they stop receiving nutrients. This is the main reason that people experience muscle spasms. As a person with muscle and skeletal issues from injuries, the severe muscle spasms can be debilitating. Lemon juice also helps with weight loss. I am happy to report that I don’t experience muscle spasms any longer. My healthy muscles continue to get stronger every day! Change #3: As a BBQ restaurant owner, you can imagine that I ate a LOT of meat. In the past when I wanted to lose a few pounds, I would do a low carb diet and drop off 20 pounds in no time. I followed the Adkins Diet years ago and it worked for me. This time was different. I had to lose a lot of weight quickly to regain my health. I STOPPED EATING BEEF AND PORK, rarely ate chicken, but would eat eggs and fish. I also stopped eating dairy products. I went to a primarily plant based vegan diet. Since making these changes I can tell you that I am a lot happier and healthier. I feel great! I exercise regularly and I have now cut chicken, most fish and eggs out of my diet and am almost entirely plant based. Essentially, I have followed an anti-inflammatory diet. My follow up post on this is here. As a Vegan, one of my primary concerns was getting enough protein. I will do a follow-up post to this concerning protein and Vegans. In the meantime, here are some decent resources if you are curious about a plant-based diet. 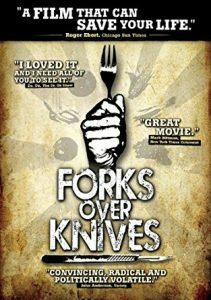 Also, check out my Top Amazon Vegan Picks here. That is really fascinating, You are a skilled blogger. I’ve joined your rss feed and look forward to more of your wonderful post. Also, I’ve shared your web site in my social networks! !